Shane Conway (pictured in action for the Kerry U21 hurlers) starred for UCC today. DEFENDING CHAMPIONS UL have been beaten in their first Electric Ireland Fitzgibbon Cup outing of 2019 by roll of honour leaders UCC. Level on ten occasions throughout the contest, the livelier Cork college came out deserving winners with Kerry’s Shane Conway and Cork’s Chris O’Leary their scorers in chief. Barry Murphy put the hosts in front at the off with the Doon man firing over a placed ball. UCC responded with five of the next eight scores, the highlight being a Mark Coleman sideline cut from 30m. Coleman’s county colleague Shane Kingston almost raided for goal from the puckout but Jamie Power got down well to deny the Douglas sharpshooter. At the other end, UL won a penalty but in the resulting attempt Murphy stepped over the 21m line and referee Fergal Horgan disallowed the goal. Three points in succession via Kevin O’Brien, Tom Morrissey and Jordan Henley had Gary Kirby’s side back on level terms with twenty minutes played. However efforts from Michael O’Halloran, O’Leary, Kingston and Conway would put the Leesiders 0-11 to 0-9 ahead at the interval. Within a matter of minutes, UL had equalised with a long distance point from Shane Golden the pick of the scores. UCC’s greater movement off the ball was allowing them create far more opportunities and they reeled off successful attempts from David Griffin, Shane Conway, Shane Kingston and Robbie O’Flynn to really exert their dominance on proceedings. 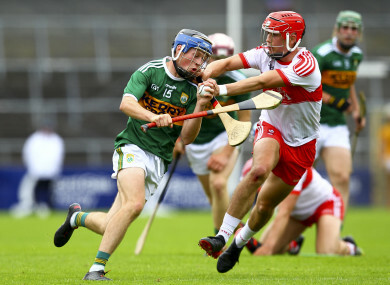 In a move to bolster their attack, Ronan Lynch who had been operating as a sweeper was pushed forward but to no avail as every score they got was answered at the other end. Over the hour, UL failed to test their opposing goalkeeper, Jack Barry. Defensively they struggled with the pace of the UCC attack and in what was their only home game, Gary Kirby will be disappointed to have failed to grab the win. Up front they performed better but nowhere near the standards they have set in this competition. They travel to Galway on Thursday for a must win tie against NUIG where they will be hopeful to have some of their injured personnel back in action. Tom Kingston’s UCC certainly laid down a marker with this six point victory. They came to Limerick determined to go home successful and they have put their hands up as contenders to add to their 38 Fitzgibbon Cup titles. They glided past their opponents attack after attack with Shane Kingston, Mark Coleman, Shane Conway, Robbie O’Flynn, Chris O’Leary and Paddy O’Loughlin most impressive. A home clash with UCD on Wednesday is next on their minds. Scorers for UCC: Shane Conway 0-9 (0-4f), Chris O’Leary 0-7 (0-5f 0-2’65), Shane Kingston 0-3, Robbie O’Flynn, Michael O’Halloran 0-2 each, Mark Coleman (0-1 sideline), Conor Browne, David Griffin 0-1 each. Scorers for UL: Martin Keoghan, Barry Murphy (0-4f) 0-4 each, Jake Morris (0-3), Shane Golden, Ronan Lynch (0-1f, 0-1 ’65) 0-2 each, Ian Galvin, Tom Morrissey, Kevin O’Brien, Jordan Henley, Shane Veale 0-1 each. There was plenty action elsewhere today in the group stages of the Fitzgibbon Cup. A couple of late pointed frees from Ronan Hayes helped UCD grab a draw in Belfield against NUI Galway while UCC are top of that group after their success over UL. Limerick’s Diarmuid Byrne hit the winning point in Group B as LIT defeated IT Carlow by 1-14 to 1-13. Brian Fanning netted for the winners with Wexford’s Seamus Casey striking the goal for IT Carlow. In the same group Trinity College won out by five points in Borris-Ileigh against Garda College. Last year’s finalists DCU ran out two-point victors over Waterford IT in Group C while 2016 and 2017 champions Mary Immaculate College made a winning start in Group D over Dublin IT by 1-19 to 1-14. Aaron Gillane struck some key second-half scores for Mary Immaculate College as they bounced back to win by five after trailing by three at the interval. Email “0-9 for Kerry's Conway as UCC defeat title holders UL in Fitzgibbon Cup opener”. Feedback on “0-9 for Kerry's Conway as UCC defeat title holders UL in Fitzgibbon Cup opener”.